How does a long-established banking school shift its educational approach to accommodate dramatic changes in the financial services industry? How does it build agility and innovative thinking in tomorrow’s leaders? 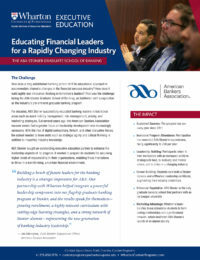 That was the challenge facing the ABA Stonier Graduate School of Banking, an institution with a reputation as the industry’s pre-eminent graduate banking program. For decades, ABA Stonier successfully educated banking leaders in traditional areas such as asset-liability management, risk management, pricing, and marketing strategies. But several years ago, the American Bankers Association became aware that a greater focus on leadership development was increasingly necessary. With the rise of digital competitors, fintech, and other disruptive forces, the school needed to hone skills such as strategic agility and critical thinking in addition to imparting industry knowledge. ABA Stonier sought an outstanding executive education partner to enhance the leadership aspects of its program. It wanted to prepare its students for assuming higher levels of responsibility in their organizations, enabling those institutions to thrive in a transforming, uncertain financial environment. 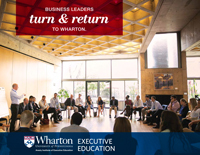 Highly interactive courses led by Wharton faculty prepare students to make fast, confident business decisions in the face of time pressure and uncertainty. One such learning vehicle is a business simulation called ARC, which stands for Alternate Reality Courseware. 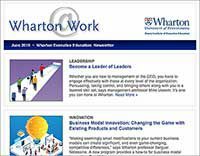 Designed by Wharton especially for ABA Stonier, the simulation breaks first year students into competitive teams in which they develop a business plan for a hypothetical product on a tight deadline. The teams are thrown various curve balls by game masters including a public relations fiasco, a cybersecurity hack, and the need to fire an employee. This unique experience takes participants out of their comfort zone, helping them to build relationships, work on key business problems, boost their decision-making skills, and refine their crisis communication abilities. Feedback from participants about the Wharton collaboration has been strongly positive. “It is already a tremendous honor to be a part of Stonier, but to also have the caliber of leadership teaching that Wharton provides is monumental,” says Amy Morbeck, a senior vice president at Arvest Bank in Overland Park, Kansas.